Once in a while, as parents, we find ourselves in a place where we have to make a choice: stay at home or (if possible) take the kiddos to work with us. Luckily, here at HG Logistics, a third party freight broker in Cincinnati, Ohio, family is welcome. With just a head’s up notice, bringing in a youngster who is not ill is typically an okay thing to do. While there are designated days for this, sometimes it is an emergency situation. As a parent, it is nice to know that I have the option. As a coworker, however, things can get tricky. A simple search can turn up article after article about why is it not okay to take your children to work. Instead of focusing on the worry about how to handle the situation, let’s take a look at what can be gained. In the past, I have had to bring my children to school on snow days. Luckily, there was space for them and they all had assignments and reading to do. Keeping them quiet wasn’t much of a challenge and they got to see what it is that I do. It was good for them to observe an office atmosphere in a way that was not intrusive to other workers, but where they could also feel productive in their own way, even if it wasn’t contributing to the business. Other times, children can really be a novelty to brighten up the day. Having a fresh face perks people up, and having the energy and youth of a child around can also help bring smiles to faces. It also engages coworkers in a new way. They get to see the family side of one another, and how people interact differently with children of different ages. As children grow older, they can truly be a help in the office. Whether it is filing, making copies or fetching coffee, kids can do the jobs that are easily done but sometimes get put off. At the same time, there is a mutual benefit, because the young ones are also learning about helping out, team work and how to operate in a professional environment. They can also glean greater lessons from their experience that one day might pop up into their memory in their future professional lives. Today, for example, the Greek girls came in. Taylor and Jada are pictured above, learning one of life’s dirty lessons: someone has to take out the garbage! 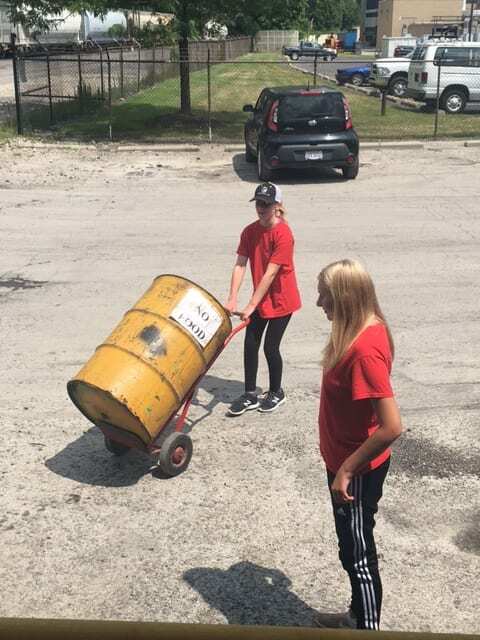 While it might seem yucky, sometimes it takes these kinds of experiences to help young people realize the importance of hard work, doing your best at all tasks, and being part of a team that takes pride in their space. The girls also had to exercise their minds, as our General Manager, Doug, had the girls come up with creative HG Logistics logos. They even had a friendly contest for the best business quote. They came up with “The purpose of a business is to create customers who create customers” and “Don’t focus on being busy, focus on being productive”. Not too bad! Family is important here at HG Logistics, and we value the openness of the office and having the option to bring our kids in, in a pinch. We also value the visits we have with our coworkers’ children. We get to learn more about one another, and instill some insight at the same time. If family oriented businesses like HG are up your alley, give us a call at 513-244-3026. HG is always in the market for sales agents and we would love to help you with your shipping needs!